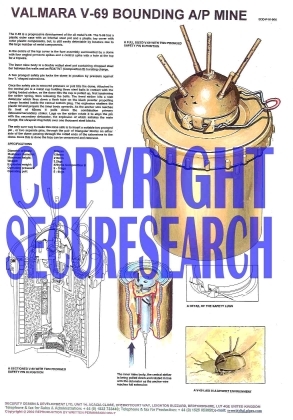 This security poster illustrates Valmara V-69 Italian Bounding Anti-Personnel Mine. This mine was used extensively in the recent Middle East conflicts. This security poster features the technical specifications of the V-69, a full-sized V-69 with two-pronged safety pin in position, detail of the safety-lugs, a V-69 laid in a desert environment, a sectioned V-69 with two-pronged safety pin in position, and the inner mine body where the central striker is being pulled down and rotated in line with the detonator as the anchor wire reaches full extension. A full-sized V-69 with two-pronged safety pin in position. A sectioned V-69 with two-pronged safety pin in position. A detail of the safety-lugs. A V-69 laid in a desert environment. The inner mine body, the central striker is being pulled down and rotated in line with the detonator as the anchor wire reaches full extension. The technical specifications of the V-69. This security poster features the technical specifications of the V-69, a full-sized V-69 with two-pronged safety pin in position, detail of the safety-lugs, a V-69 laid in a desert environment, a sectioned V-69 with two-pronged safety pin in position, and the inner mine body.